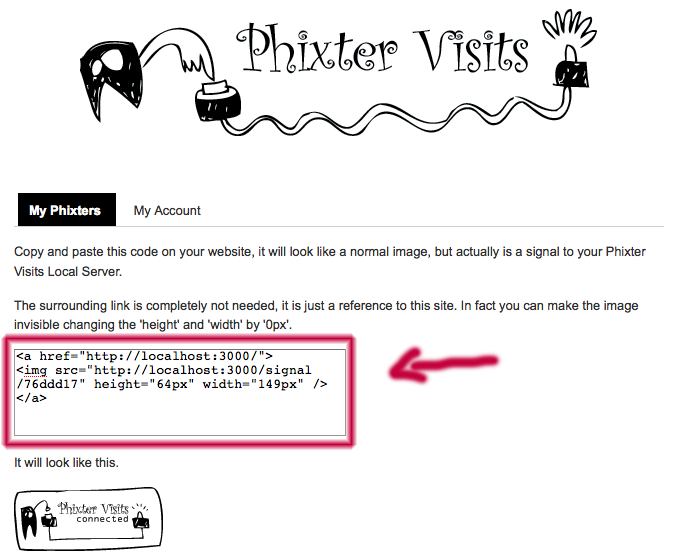 PhixterVisits is a way to convert an user visit on your web site into a blinking led on your desktop. I have received for my birthday present one of the most awesome presents a geek can received: an Arduino Workshop Kit. The first experiment I did was, of course, a Hello World, and after that I build something I was feeling like doing for long time: blink a led when someone visits my website. This is very useless thing, I know and I don’t care, I just think that when something happens on the web and it become in something real on my table this is kind of magic. On the beginning was a very simple experiment and withing an afternoon I build an small Sinatra project that received requests with a numerical parameter, the Sinatra webapp sent a signal to an script on my computer through a socket, and my computer finally sent this numerical value to the Arduino that knew with led to blink on depending the value. This was awesome, I could to hidden an ‘img’ html element on my website asking for an image that in fact was a request to the Sinatra webapp and then the rest worked by it self. Finally I wanted to play a competition with my girlfriend, she has a very most popular website than mine is, and then I was thinking to do all this stuff much easier to configure so this is because PhixterVisits born. This is the most simple layer. It is a simple Arduino sketch that opens a Serial connection with your computer waiting for numerical values from 1 to 11, on depending the value received the Arduino will send a signal to one of its digital output connections. The circuit is also very simple as you can see on the ‘How to Install It’ section. The local server is also very simple but I’ve complicated it becoming what was a simple console script on a wxRuby desktop application so you can configure it and test it visually. 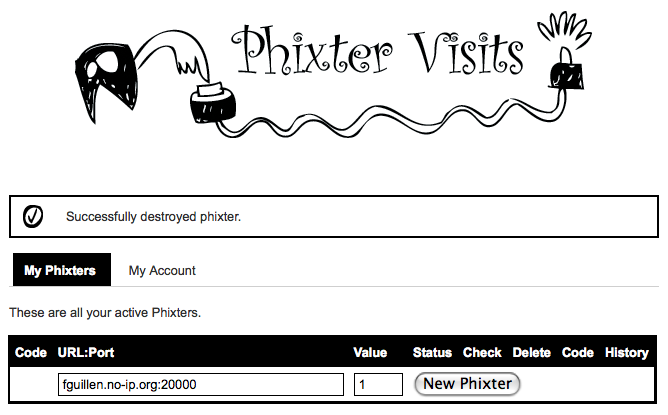 Is a Rails application where you can register your self and configure what I call ‘Phixters’. 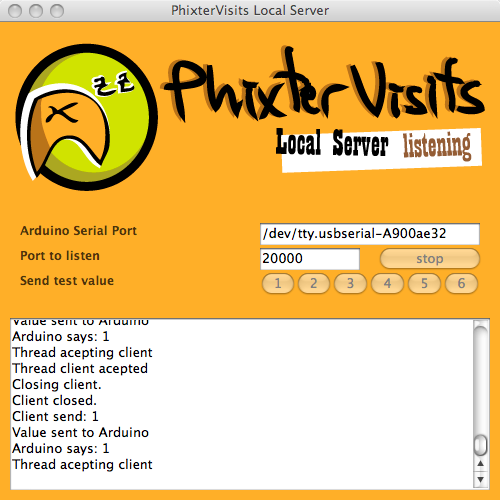 The Phixters are composed by an ‘URL:Port’ address what is your local computer public ip and the port where the Local Server is listening. 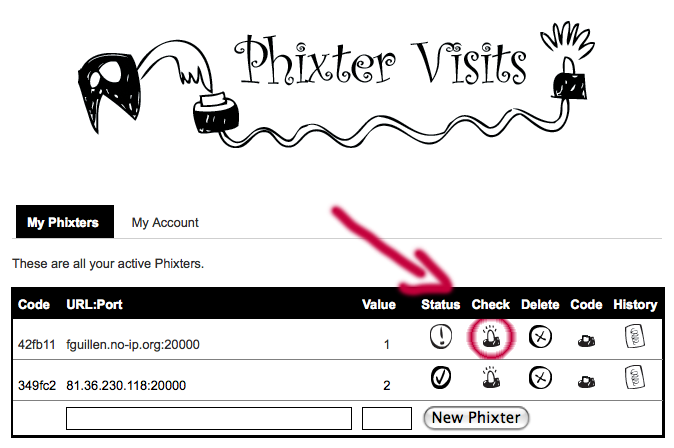 You configure a value for each Phixter. And finally you can copy a very small piece of html code that you have to paste on whatever place of your website you want. This piece of html code is the one that hides the Web Service request on an image so when your user visitors are watching an image a signal was sent to the Web Service. 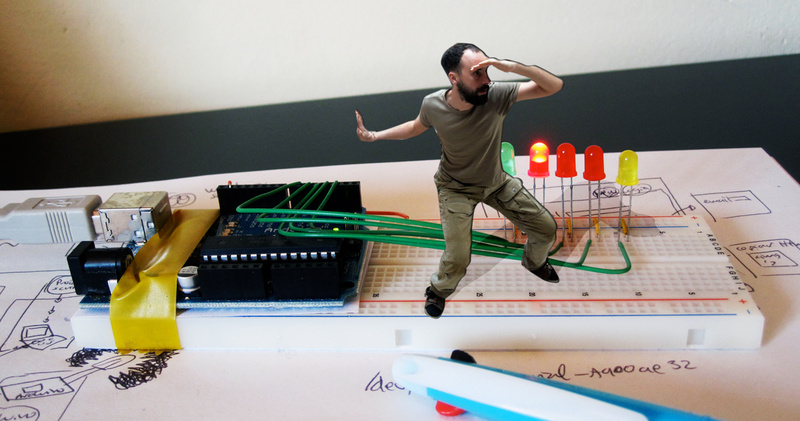 I suppose you have a few experience with Arduino, at less you have obtained to operate the ‘Hello World’ with Arduino. 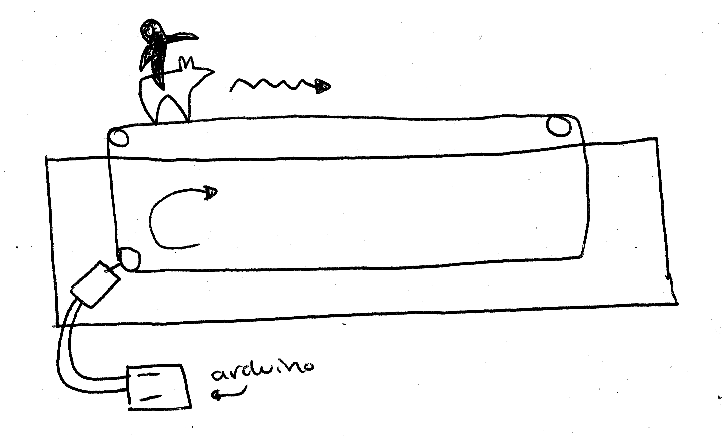 Download the Arduino Sketch and upload it to your Arduino controller. Build the circuit as show in this draw. On this draw and on all my tests there are only 6 leds but you can fill all the digital outputs with leds and they suppose to work. Put atention that the digital outputs 0 and 1 are not being used, that is because on the circuit there is printed ‘RX’ and ‘TX’ on this out puts and I didn’t want any serial communication interference (I really don’t know if this interference was going to happened). For test it you can open the ‘Serial Monitor’ of your Arduino app and send numerical values like ‘1′ or ‘2′ or ‘6′, the corresponding leds should blink for while. Download the ‘Local Server’ wxRuby desktop application. You have to know the name of the USB port of your Arduino and replace the text box named ‘Arduino Serial Port’ with yours one. Select a port where you want the Local Server listens, for example ‘20000′. If you want to test it you can push ’stop’ and play with the ‘Send test value’ buttons. If you click on these buttons a corresponding led should blink. Press ‘listen’ again and let the Local Server listening. On URL:Port you have to put the public IP of your computer (or whatever computer your Local Server is listing), the Port is the port you have said to Local Server to listen. Look that I’m using the ‘no-ip.com’ service so I don’t have to take care of my non-static public IP. You can create any number of Phixters you want, one of them could be for a different website, just take care you are using the correct ‘code’ of each one. Very important also is that I’m not going to talk about how to configure the NAT of my home router. This is diferent on each router and is the same theory of ‘opening the ports’ for your emule. Although I’m not talking of this step, this step is very important and the Web Service won’t can talk with your Local Server if this is not well configured. 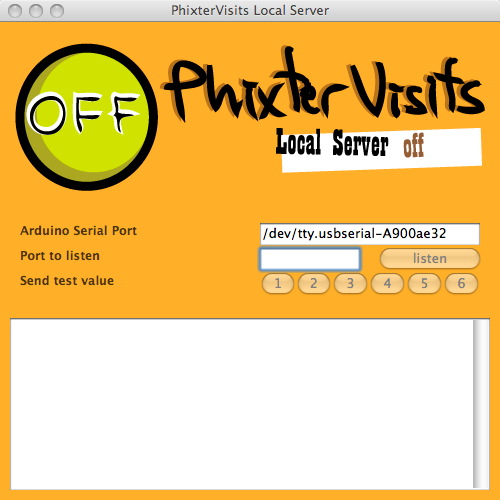 This will send a signal to the URL:Port configured on this Phixter sending the value indicated, if everything is connected and working a led will blink on your Arduino circuit and a Ok message will appear on the Web Server page. And paste it on some place on your web site, be intelligent here and don’t put it on a place that an image is not going to be loaded. From now on each time your website is loaded this image will want to be loaded and a request will arrive to the Web Service which will send a signal to your Local Server which will send a signal to your Arduino which will make the corresponding led to blink. The game now is to connect to the Arduino not leds but DC motors so when a signal arrive the motor will work for a while and then stop until the next signal arrive. The motor will move some kind of figure like a horse or something then the race can start. Also will be great not to depend on a computer to communicate with the Web Service, using a ethernet interface directly connected to Arduino could be great. 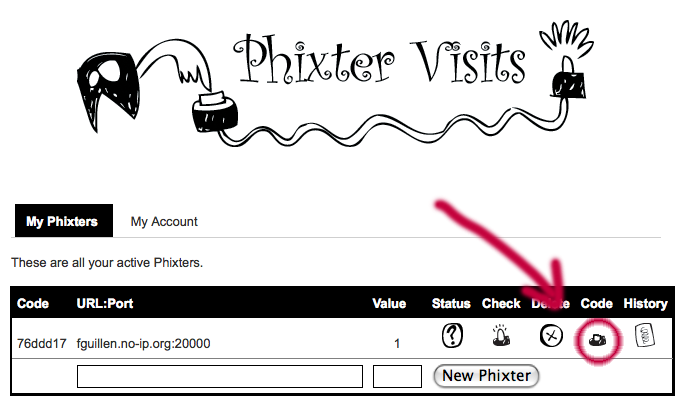 All the code of this project, even the the Phixter Visits Web Service is available on the Phixter Visits Github Repository. Play with this code and instructions on your own risk, I’m a very beginner on all of this Arduino stuff and some problems could happen to your loved kit. You can do whatever you want with the code, attributions will be grateful. Phixter Visits by Fernando Guillen is licensed under a Creative Commons Attribution 3.0 Unported License. VerbConjugations is simple iPhone application that tries to help the people that is learning Spanish to find out how a verb is conjugated. With this application you can ask for any infinitive verb and you’ll obtain how this verb is conjugated is different tenses and persons. The application also has an offline mode so you can check the verbs already searched without Internet connection. The application works on any iPhone/iPod with SDK 3.0 or higher. Let it a try, it is free, and leave a review, it is my first iPhone app and I would love to receive any kind of comment or issue. The license is completely opened and you can check/download the code on the iPhoneVerbConjugations GitHub repository. How many lentils are there in the jar? ... let me the jar, and I’ll keep you informed of how many lentils are there in it as I’m counting them. Software development is a box of wonderful surprises and the community I have found around Ruby on Rails is the most passionate I have never met. 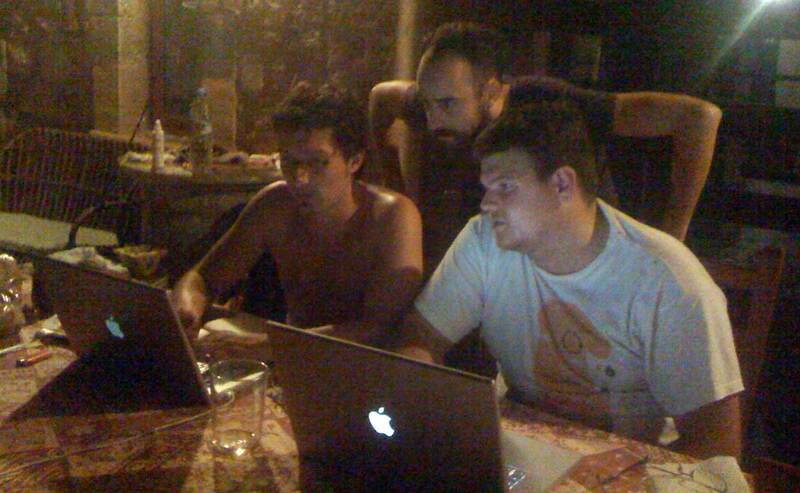 The last crazy geek stuff I have been involved in was the RailsRumble. A contest where small web development teams have to show what they are able to build in only 48 hours. Of course the web framework to use is Ruby on Rails, which other can you use to implement something almost finished in only this bunch of hours? Our group was formed by Raimond Garcia, Felipe Talavera, Carlos Matallín and me. Within a few days of cross mailing conversation we had an approximate idea of what we were gonna build. The 3 developers get together at my house in Mallorca, our designer and front developer, Carlos Matallín, could not enjoy physically the experience with us, but was on continuous contact through mail, skype and video conference. 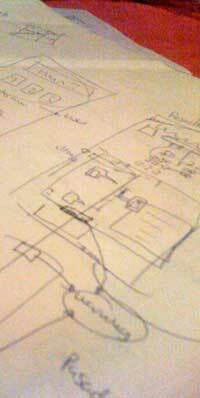 The previous night was the discussion time.. a few cups of coffee and a lot of pen and paper, our idea was incredibly simple and could become something incredibly helpful, but it was full of small details and possible solutions that should be decided before work started. 2am, Day D -2, Hour H -48, the time of the first commit, just a very concise README.md file and go to sleep. When I waked up in the morning my partner Felipe had already the server standing up and our most important tool working: the mail digester. The day was very pleasing, not any pressure stressed us, our code was responding our expectations incredibly well, Raimond was concentrated on the integration test layer of our application, Carlos was sending us very correct designs time at a time, Felipe working here and there knowing all the stack of the application and me focusing on the mail parser. Time at a time we reset our bodies with a very cold dip up on our small swimming-pool. At the end of the first day our application was working. Not on any casuistic worked well, but it was working. The second and last day supposed to be only to correct details and test any problematic casuistics, I don’t know if it was for overconfidence or because the problems to resolve were too hard to resolve but the last commit was exactly at 2am on Sunday, that means Hour H on Day D.
The supposed objective of the RailsRumble is to convince the expert judges that our application developed on 48 hours is above the rest of them.. Our project was judged as the #57 of more than 200 applications. Not available to pass to the next level: the public vote. That suppose to mean that we failed. Nothing further from the truth. We built something very transgressor, very innovative and also very simple, we were congratulated for one of the most known Ruby on Rail gurus: Obie Fernandez, we enjoyed ourself a wonderful geek weekend and we have decided to improve the code and to expose it to the community to see if it becomes as helpful as we think. And over all we were full up of new inspiration and energized passion towards our profession. What was that we were working this weekend? 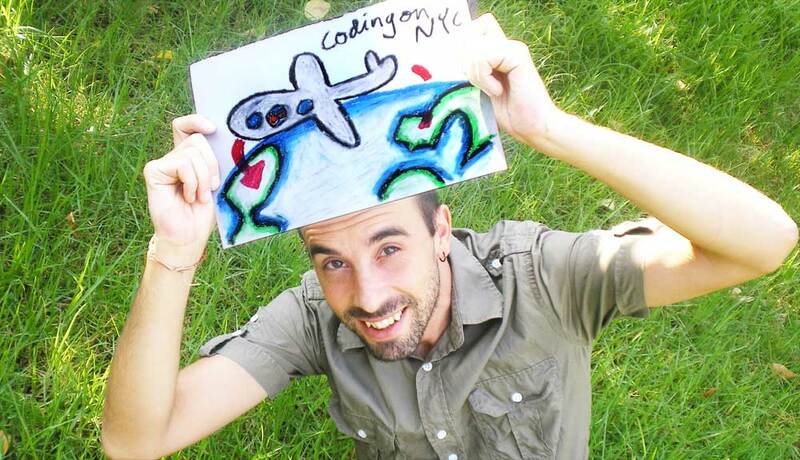 … :), the new mailing bot to help your mailing list with informal votes: LetsDecide.us. I’ll talk more concise about it on future post. OneOfZombies is an experiment proyect. Don’t come here looking for game development knowledge or very pretty Ruby code design. This is just me playing with Ruby and with Gosu. 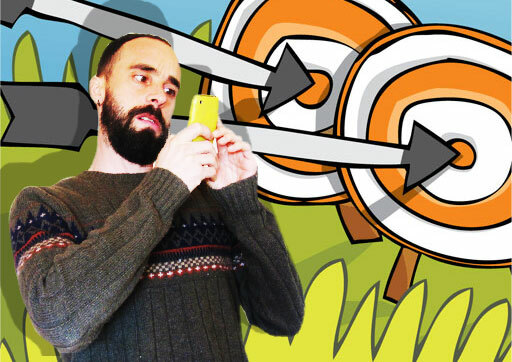 After a few weeks working and studding on my free time I can show you this brutal stupid 2D game. This is not a quality project, this is not a professional stuff. I am just enjoying my self and having fun, and by the way I hope you will have fun too!. The game is very stupid, and the code is very ugly and dirty, I just wanted to test the Gosy library, and I have not experience on game development. It is the first time I put my self on a pure Ruby project with more of one class. I have had such an experience with Rails and still learning! and I realize that I have got no idea about Ruby. If you want you can go to the OneOfZombies official site and try to understand what is all of this about. You can also download the Mac OSX version, or the source code, so you will can test it on your own keyboard. Following with the completor suggestor I was playing, I had the need to delete the last word from cursor before the completor writes the suggestion selected. This script is almost not tested, it works for me on FireFox 3.0.11 and Safari 4.0.1, so use it under your own responsability. I was enjoying trying to develop a kind of completor suggestor on a textarea, I wanted it to jump when the tab key was pressed, that what easy with capturing the keydown event and the help of event.preventDefault. But the thing what wasn’t such easy was the capturing the last word on the textarea from the cursor.